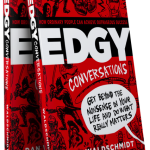 After reading that first sentence in the prologue of Edgy Conversations: How Ordinary People Can Achieve Outrageous Success, I was hooked. Finally, someone dared to tell share the real deal on what it means to be human and searching for meaning and success. This was NOT the typical ‘Ten Steps to Success’ book. Kelly McCormick’s Tips to Succeed –No Matter What! Enlightened entrepreneurs, and successful companies, know that a secret to success is to have a ‘no matter what’ attitude. We look for opportunities to move forward, in spite of what others may think. Then we go for it. Here are some of my ‘glass half full’ tips on how to succeed –no matter what! 4 Tips to ‘Raise Your Thoughts’ & Your Business Income! What you ‘think’ is what you get. We’ve all heard it. Yet few people know how to ‘profit’ from this principle. Well except for approx. 10 million millionaires in the USA, and some powerful forward thinkers. Here are some of my tips and techniques to raise your thoughts and income. Why People Make Money – In Any Economy! Yes, there are people and companies making money right now. A lot of it! Here are some facts, thoughts and tips to catapult you into the big leagues. According to CNBC, “The number of millionaires in the [United States] is growing. The U.S. has more than 10 million. How to FIRE a Client! 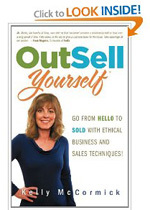 , OutSell Yourself ® a division of The McCormick Team Inc. All rights reserved.